The German manufactured Riga Hobby Greenhouse Kit is built to last. The Riga Hobby Greenhouse comes standard with 8mm polycarbonate on the roof and sidewalls and 10mm twin wall polycarbonate on the endwalls. No other hobby greenhouse kit on the market comes standard with this kind of insulation. It includes (1) roof vent, (1) large rear wall window, and (1) Dutch door. The Riga backyard greenhouse has a beautiful "onion-shaped" design, as well as being one of the sturdiest hobby greenhouses we offer. This is not only attractive but aids in shedding snow loads. The frame is rustproof, extruded aluminum and working parts on doors and windows are heavy-duty. 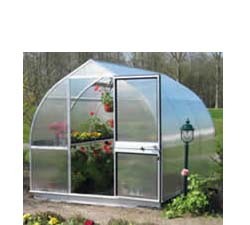 The Riga greenhouse features a unique slide-together "channel" design that allows simple assembly of the aluminum greenhouse components. Standard Accessories Included: Roof Window, Auto-window opener, Oversized hinged rear door.